(First off, I did not take this picture – I found it online) So… last night around 7 pm, Denis and I were out in the back yard and saw a large bird fly over our heads and land in a tree. Denis said, “That’s an owl. Get your camera!” I ran in and got my zoom lens and took some pictures but it was getting dark and the photos were blurred. But still, it was pretty exciting to see it in person. We usually just hear them at night. 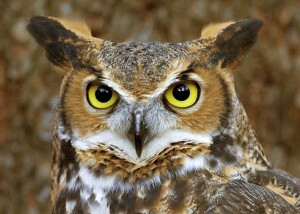 This photo shows the kind it was… a Great Horned Owl. It was huge! Then I decided to try taking video so I went back for my camcorder. Ready to shoot, I said, “Denis, see if you can get him to fly.” So Denis started flailing his arms and making noise but the bird just stared at us, probably wondering if we had food. “Throw something in his direction, maybe he’ll fly,” I said. Denis took a lemon off our tree and pitched it hard but the owl was too far away. So we watched him until it got too dark to see. Then this morning I remembered I just bought a plastic snake. It’s so real-looking I had to show the gardeners it wasn’t real so they wouldn’t attack it with a shovel. I should have put the snake on the ground and waited for the owl to swoop down and carry it away. So tonight, I’m setting up a sting. I’m putting my plastic snake on the ground and hiding behind a bush with my video camera to see if he comes back. That could work, couldn’t it? Or do I need to get a job? It looks like my rabbit is here to stay. As a standup comedian, I adored Phyllis Diller, who passed away today at the age of 95. Not only did Ms Diller pave the way for all women comics, she was really, really funny. I was beyond excited when she appeared on my talk show in 1991 while it was only a test run in Las Vegas called Just Between Us. What a genuinely nice person she was. Thank you, Phyllis, for the decades of laughter. Driving to Vegas in August… what was I thinking? It was 110 degrees! Going to hell doesn’t scare me now. We went for three days and I guess I’m not a very good traveller. It took me more days to pack than we spent in Vegas. I had to bring sandwiches & drinks for the road, 110 proof sunblock, my own sheets, my teapot, disinfectant wipes, hard boiled eggs, phone chargers, my skincare products… I forgot my face scrub but that’s okay – I just rubbed my face with the hotel washcloth. When we hit the casino, I couldn’t breathe. I said to Denis, “This must be a smokers’ convention.” Or else people who quit years ago were so stressed about losing money, they started smoking again. I tried to have fun but it seems like I enjoyed Vegas more when I was younger. The clubs are all so loud. Where I enjoyed the music most on this trip, was in the elevator. They need more Cirque du Soleil shows in Vegas. Com’on! There’s too many! They’re not even exciting any more. With titles like “O” and “KA” I should send them my idea: “BLAH” – acrobatics based on the history of how paint dries. Even my gambling was a bust. I lost my twenty dollars at blackjack in less than a minute. They should call it Whackjack: as soon as you start putting money on the table, they whack you with a big stick. We have an EXACT winner! Congratulations, Kari !! You should head for Vegas right now because you guessed 1,721 tomatoes and by 10 this morning, I picked exactly 1,721 tomatoes! 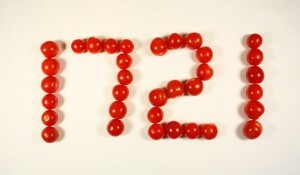 Kari guessed 1,721 and when I counted my tomatoes up this morning I was shocked that someone hit the exact number. I still can’t believe it! And Lee (from my hometown – go, London!) came close with his guess of 1,758. A lot of you missed the blog posting just below where I said that I had already picked 1,014 tomatoes by July 29th. This tomato plant is still producing like crazy! I thought it would be almost spent by now but it looks like I will eventually get about two and a half thousand tomatoes. 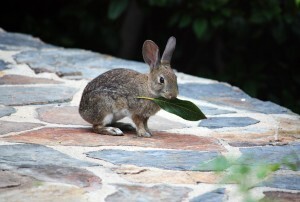 Enough for me, the rabbit, and the mangy, rat-faced, no-good, low-life, beady-eyed, scum-sucking, tomato-eating squirrel. Thanks, everybody, for playing. Kari, your gift card is on the way! This is crazy! Here’s what I just picked tonight at 6 o’clock. Sixty-two more tomatoes for a new total of 1,783! Win $100 American Express gift card! 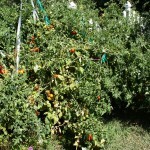 ~~It’s one humungous plant that showed up on its own and I started picking ripe tomatoes on July 6th. ~~They are large (and delicious) cherry tomatoes. ~~The plant is around 25 feet long, 6 feet tall, and around 15 feet wide. 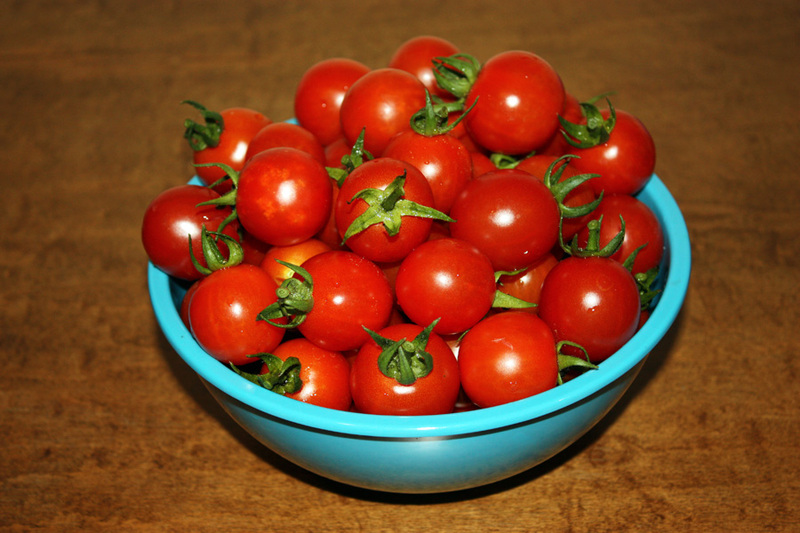 ~~I’ve been picking tomatoes every day. ~~Someone is picking & counting tomatoes while I’m in Vegas, too. ~~We won’t be counting the ones eaten by the mangy, rat-faced, no-good, low-life, beady-eyed, scum-sucking squirrel. 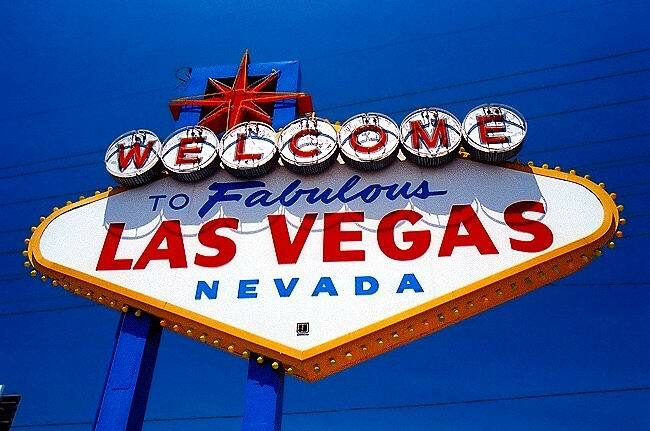 Denis and I are off to Las Vegas for a few days. So what if it’s 107 degrees? Okay… it was my idea. I’m not concerned about the weather (just crank up the a/c! 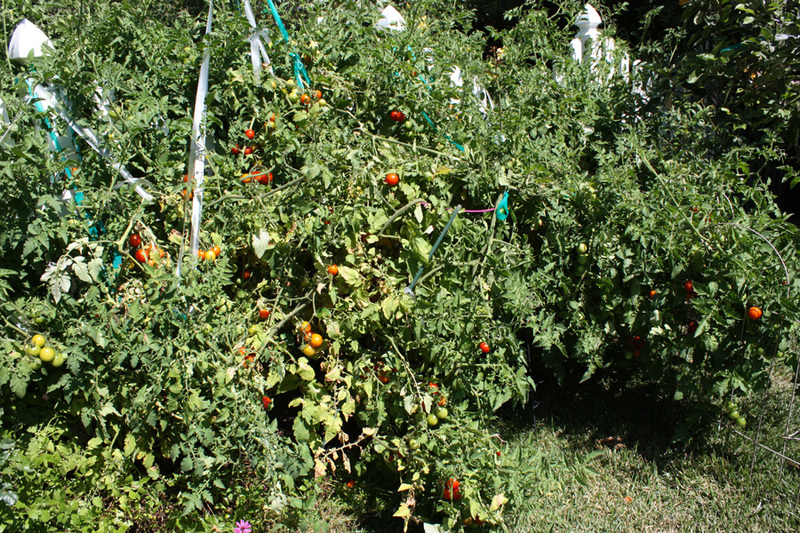 ), but what about my tomatoes? And my hummingbirds? 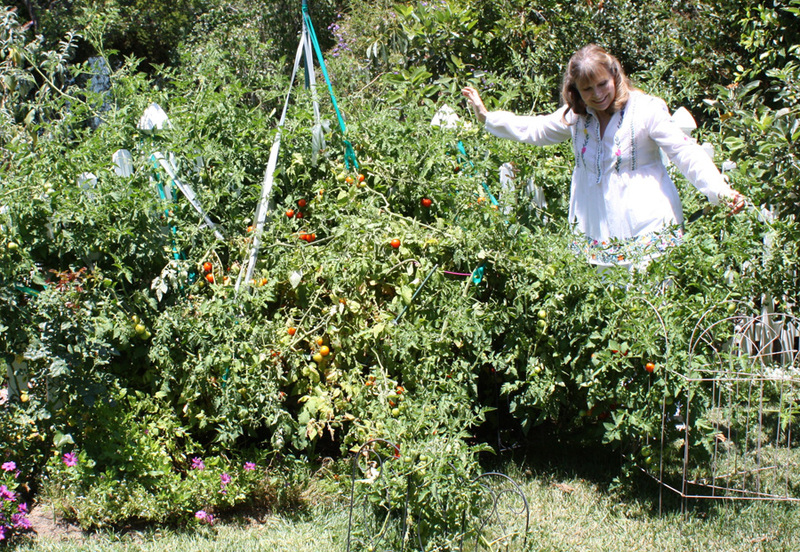 Who’s going to pick tomatoes and feed the mass of hummingbirds around here? No worries. We’ve arranged alternating shifts of people to come by every day to pick & count tomatoes (to make sure that mangy, rat-faced, no-good, low-life, beady-eyed, scum-sucking, tomato-eating squirrel doesn’t get them) and fill the bird feeders. I should be worried about my gambling luck in Vegas but noooo, I’m more concerned about the birds running out of food! Oh well, I’ll have peace of mind to focus on the $20 I plan to gamble away. That’s all I’m willing to lose! The car is gassed up and it’s only a 4 1/2 hour drive but I like to be prepared. So I’m taking hard boiled eggs, cut up carrots & peppers, salmon sandwiches, homemade oatmeal cookies, apples, bananas, water, kleenex, paper towels, handiwipes & bandaids. That’s just for the ride. Once we get there, it’s party time! I’m staying up ’til midnight!